It was 2001 when Sano Masumi, owner of Sano Gallery in Kagawa Prefecture on Shikoku and known to those in the contemporary art world, started doing volunteer activities through art in Nepal. Sano created the NGO Pahenlo after purchasing and renovating a small building in the backstreets of Patan, a city in the southern part of the Kathmandu Valley, and setting herself up teaching art to children outside of school. 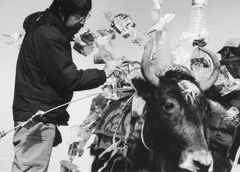 A project that involved seven artists from Japan making video works in different locations throughout Asia developed in tandem with her teaching. The works by the seven artists have finally been completed, and will be premiered together in conjunction with the publication of a book introducing the project (Pahenlo, Art in Nepal, 2007, Bijutsu Shuppansha).